The first thing to consider when starting a vegetable garden is light. Most vegetables, fruits and herbs grow best in full sunshine – somewhere that receives at least six hours and preferably eight hours of direct sunshine a day, though some shading is welcome in hotter climates. Some cool-season crops – for example spinach, cabbage and radishes – can be grown in part shade, while there are plenty of flowers for both sunny and shady locations. You’ll need to tend your garden regularly, so if possible position it close to the house where you will see it – that way you won’t forget about it and can see what needs doing as it needs doing. Try to site it near a source of water, or install water barrels or other means of collecting rainwater close by to make watering quick and easy. Lavish your soil with love. Nourish it with organic matter, including garden compost and manure. Manure must be rotted down for at least six months before applying it because fresh manure contains weed seeds, can harbor disease and may ‘burn’ plants due to its very high nitrogen content. Add organic matter whenever you can and at least once a year. This can be simply laid on the soil surface, as what’s known as a ‘mulch’. Over time your soil’s structure will improve, becoming better draining and a healthier environment for roots. You can add organic fertilizers too of course, but think of these as a short-term boost, rather than building up long-term soil health like organic matter can. As a new gardener it’s easy to get carried away, but a little restraint is essential. Plant too soon and tender plants are likely to be caught out by a sudden frost or will fail to thrive as they grow on. In most areas your last and first frost dates define your growing season. Our Garden Planner can help. It automatically calculates your frost dates based on your location. As you add plants to your plan the accompanying Plant List grows too. Open it up and you’ll be able to see exactly when you should be sowing, planting and harvesting your chosen crops. Begin sowing outside only once your soil has warmed up and dried out enough to become workable. Seed beds – that’s the area you sow into – should have a fine, crumbly texture. Sowing under cover into plug trays and pots is a great way to get a head start while outside temperatures are still too low, but they'll need plenty of light for a good start. Potting soil is darker-colored than garden soil, so filling rows with all-purpose potting soil after planting seeds can help you to distinguish your own seedlings from any weeds that emerge. Transplants need planting holes that are bigger than the existing rootball. The soil then used to fill in the hole will be looser, which will make it easier for new roots to grow out into the surrounding soil and help plants to establish quicker in their new home. Most plants need an average of 1-2 inches or 2-5cm of water a week. You’ll probably need to water more as it gets warmer, but this does depend on rainfall. It’s better to water heavily, once a week, than a little every day. This forces roots to reach further down into the soil to seek moisture, improving self-reliance. Plants in containers can’t do this of course, so water them more often. Weeds compete with your plants for moisture and nutrients. Remove weeds as soon as you see them so they don’t have a chance to produce seeds and spread. 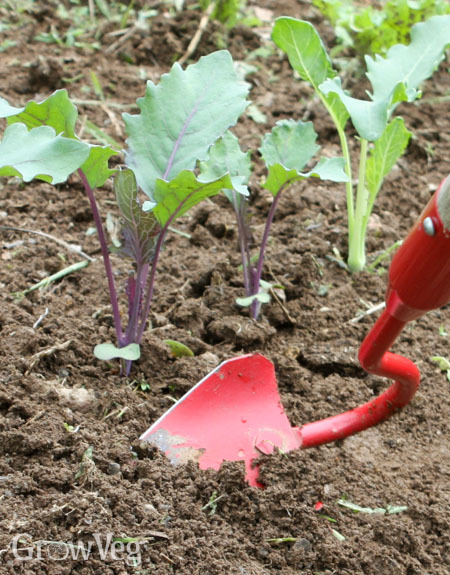 Hoeing is quick and easy, and severed weeds may be left where they fall to wither in the sun. Keep the blade edge sharp and close to the surface to prevent damaging crop roots. Hand-weed where the hoe can’t reach. 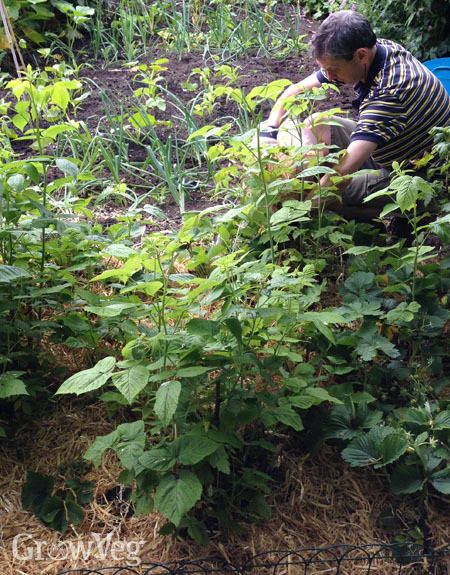 Mulching with organic matter is a great way stop new weeds popping up as well as improving your soil as it gradually rots down. Some vegetables must be picked regularly to keep the harvests coming. Beans, zucchini and tomatoes are just a few examples where picking will encourage even more pods and fruits to follow. Similarly, removing old blooms from ornamental flowers – called ‘deadheading’ – encourages more to follow, extending the display a little longer. An end-of-season tidy up is a great way to ensure a clean start the following year, but don’t get too carried away. Old seed heads of, for example, coneflowers and thistles will help feed birds over winter, while ornamental grasses can be left to add movement and structure to the garden – and overwintering sites for beneficial bugs such as butterflies. Fallen leaves are a welcome resource. Add them to compost heaps, compost them alone to turn them into leafmold, or pile them thickly over tender perennials to protect them over winter. Good gardeners make lots of mistakes but they learn from them! By keeping track of when, where and what you grew and noting any pests, diseases or failures, you can build up a personal record of what works best for you and your garden. Take advantage of our free online Garden Journal, which makes record keeping easy. Take photos outside, on the go, then upload them with your written notes. Record when you planted, watered and tended your crops, get to the bottom of problems, and see how much you’ve harvested.